H. Kirke White, age 88, of Saugatuck, Michigan, died Saturday, April 6, under the care of Hospice of Holland, at Grace of Douglas. He was born March 11, 1931, in Chicago, Illinois, and grew up there, but spent every summer at his grandmother’s cottage on the Kalamazoo River in Saugatuck. After graduating from South Shore High School, in Chicago, Kirke attended Purdue University and eventually earned a B. S. degree at Millikin University in Decatur, Illinois. It was there that he met his surviving wife, Betty, and they were married in 1954 while he was serving in the U. S. Army during the Korean conflict. When he was honorably discharged, he went to work with his father for Weber Brothers Metal Works in Chicago, and in 1958 they split off the metal manufacturing portion of the business to form Weber Brothers and White Metal Works. It was that business that Kirke moved in 1970 to Hamilton, Michigan. During his active years Kirke served as Allegan County Commissioner for Overisel, Valley and Salem Townships from 1976 to 1982. He was Chairman of the Allegan County Board of Public Works for twenty-seven years. 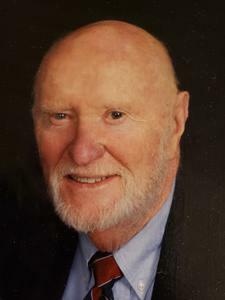 Kirke was an elder in Haven Reformed Church and president of the Lions Club while living in Hamilton and served as trustee and deacon in the First Congregational Church of Saugatuck. Wherever Kirke attended church he always sang in the choir, and after moving to Saugatuck, he would serenade the tellers at the Chemical Bank and the clerks at the grocery store in Douglas, making up songs with their names to make them smile. Kirke loved to sail, taught his children to sail, and had them crew for him when he won trophies at the Saugatuck Yacht Club. He and Betty were long-time members of Clearbrook Golf Club as well. Kirke will be fondly remembered not only by his family, but also by his bridge partners, the writing group where he wrote his Meanderings, his golfing buddies, and those for whom he created Christmas cards. Mr. White was preceded in death by his parents, Harold K. White and Elizabeth Johnston White, and although he was their only child, he grew up surrounded by many very dear aunts, uncles and cousins. His in-laws, Raymond William and Alta Harrington of Decatur, Illinois also preceded him in death. Kirke is survived by his children: Sara Sue (Bill) Van Doornik of Holland and Stuart William White and daughter-in-law, Mary Jo White of Hamilton; brother-in-law, C. Thomas (Cordia) Harrington; five grandchildren, Amanda (Paul) Rowe of Holland, Joseph Van Doornik and fiancee Marissa Ortisi of Grand Rapids, Sami White of Douglas, Nicholas (Jordyn) White and Kate White of Hamilton, and two greatgranchildren, Charlotte and Liam Rowe. A service to honor Kirke’s memory will be held at First Congregational Church of Saugatuck, 296 Hoffman Street, at 11:00 A.M. Thursday, April 11. Visitation is at the Dykstra Funeral Home - Saugatuck Chapel, 520 Lake Street, Wednesday, April 10 from 6:00 to 8:00 P.M. Reverend Sarah Terlouw officiating. Interment in Riverside Cemetery. Memorials may be made to First Congregational Church of Saugatuck, P. O. Box 633, Saugatuck, MI.